The influence of race on the frequency of suicide is evident from statistics giving the rates of mortality from this cause in various countries. Of the European peoples, the Germans, Scandinavians, English, etc., i.e., those who are mostly of the Teutonic race, are more given to self-destruction than the peoples of Celtic or Mediterranean origin. Wherever the Celtic race is in the majority the rates of suicide fall perceptibly. In the United States, where nearly all the European races live under approximately the same environment, each nationality retains its own rate of suicide. Morselli declares that religion has a great influence on the suicide rate, and that Catholics and Jews are the least liable to commit suicide. He maintains that those who are fervently devoted to religion, especially women (nuns and lay sisters), furnish very few suicides. That religion is not the only factor in such cases, however, is shown by the fact that "a great difference generally exists between Catholic and Protestant countries only, not between Catholic and Protestant inhabitants of the same country. Where the tendency to suicide is great among the latter, it will be found to be also high among the former" (Morselli). "When it is found that people living under the same social, economic, and physical environments soon come to have the same suicide rate, whatever their faith, we have proof that the difference between Protestantism and Roman Catholicism as preventives of suicide can not be great" (Strahan). Among the ancient Hebrews suicide appears not to have been very common, only four cases being definitely mentioned in the Old Testament; those of Samson, Saul and his armor-bearer, and Ahithophel; to these may perhaps be added the cases of Abimelech, Razis (II Macc. xiv. 46), and a few others. Later it appears to have become more frequent. Josephus records the suicide of several thousand Jewish soldiers who were besieged by the Romans in the stronghold of Masada in the year 72 or 73 C.E. Under medieval persecution the Jews often chose self-destruction as a means of relief. In 1190 in York, England, 500 Jews committed suicide to escape persecution; and many similar instances are to be found in the history of the Jews in England, France, and Germany. In modern times (during the first half of the nineteenth century) Jews were less liable to self-destruction. Suicide is said to be very infrequent among the Orthodox Jews in Europe, particularly those living in small towns in Russia, Poland, and Galicia. Table Showing the Average of Suicides Among Catholics, Protestants, and Jews per 1,000,000 of Population (After Morselli). From the figures in the foregoing table it is found that in most countries the order of frequency of suicide, according to religions, is: Protestants, Catholics, Jews. It is, however, a striking fact that the Jews vary more among themselves in different countries than do Catholics from Protestants, who maintain a certain relative proportion with little variation. Morselli is inclined to attribute these differences to the anthropological and social diversities observed among the Jews in various countries. This is substantiated by the fact that in Austria, where they are economically poor and socially isolated, the number of suicides per 1,000,000 Jews is only 20.7, and in Galicia only 10. On the other hand, in Baden and Bavaria, where socially and economically they are on a higher plane, the rate is as high as 140, about seven times more frequent than in Austria; while in Posen, where their condition at the time these statistics were taken was an intermediate one, the suicide rate was 38 per 1,000,000 Jews. 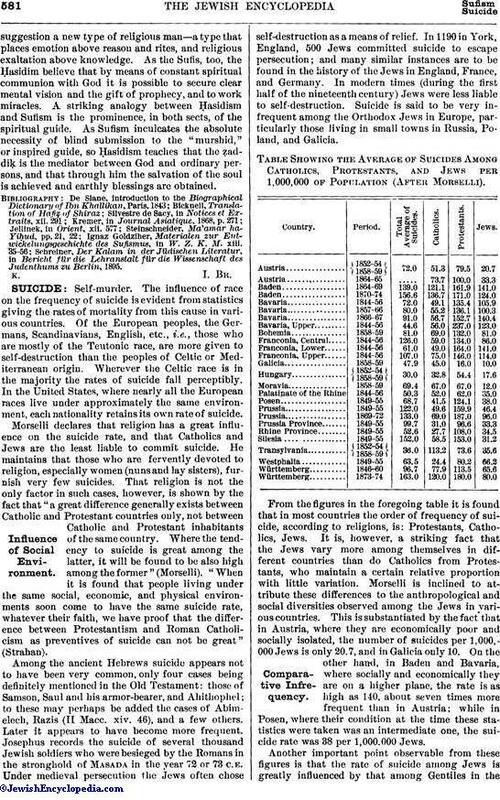 Another important point observable from these figures is that the rate of suicide among Jews is greatly influenced by that among Gentiles in thesame country; and this is particularly true when comparison is made with the Protestants, and can best be seen by comparing the rates in Austria with those in Prussia, Bavaria, and Baden. In Austria the rates are low both among the general population and among the Jews. In Baden and Prussia, where it is higher among the Christians, it is higher among the Jews also. The same is evidently true of the various provinces of Austria and Prussia. 1849-55 46.4 per 1,000,000 Jews. 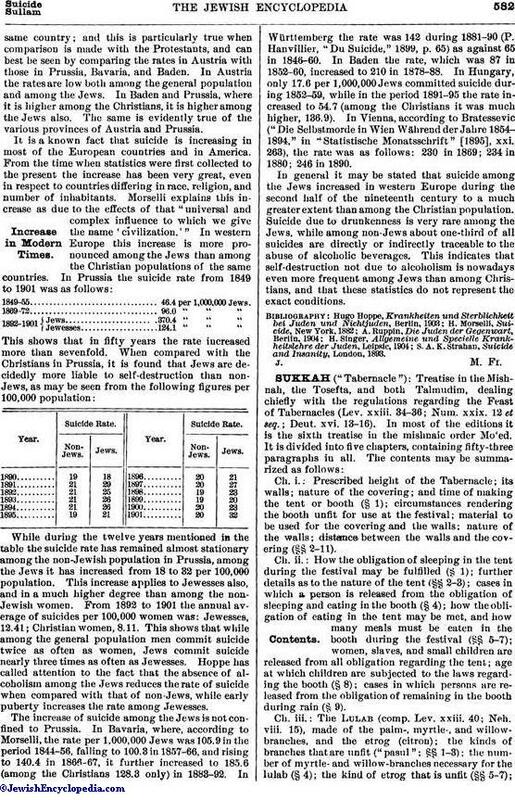 1869-72 96.0 " " "
1892-1901 Jews 370.4 " " "
Jewesses 124.1 " " "
While during the twelve years mentioned in the table the suicide rate has remained almost stationary among the non-Jewish population in Prussia, among the Jews it has increased from 18 to 32 per 100,000 population. This increase applies to Jewesses also, and in a much higher degree than among the non-Jewish women. From 1892 to 1901 the annual average of suicides per 100,000 women was: Jewesses, 12.41; Christian women, 8.11. This shows that while among the general population men commit suicide twice as often as women, Jews commit suicide nearly three times as often as Jewesses. Hoppe has called attention to the fact that the absence of alcoholism among the Jews reduces the rate of suicide when compared with that of non-Jews, while early puberty increases the rate among Jewesses. The increase of suicide among the Jews is not confined to Prussia. In Bavaria, where, according to Morselli, the rate per 1,000,000 Jews was 105.9 in the period 1844-56, falling to 100.3 in 1857-66, and rising to 140.4 in 1866-67, it further increased to 185.6 (among the Christians 128.3 only) in 1883-92. In Württemberg the rate was 142 during 1881-90 (P. Hanvillier, "Du Suicide," 1899, p. 65) as against 65 in 1846-60. In Baden the rate, which was 87 in 1852-60, increased to 210 in 1878-88. In Hungary, only 17.6 per 1,000,000 Jews committed suicide during 1852-59, while in the period 1891-95 the rate increased to 54.7 (among the Christians it was much higher, 136.9). In Vienna, according to Bratessevic ("Die Selbstmorde in Wien Während der Jahre 1854-1894," in "Statistische Monatsschrift" , xxi. 263), the rate was as follows: 230 in 1869; 234 in 1880; 246 in 1890. In general it may be stated that suicide among the Jews increased in western Europe during the second half of the nineteenth century to a much greater extent than among the Christian population. Suicide due to drunkenness is very rare among the Jews, while among non-Jews about one-third of all suicides are directly or indirectly traceable to the abuse of alcoholic beverages. This indicates that self-destruction not due to alcoholism is nowadays even more frequent among Jews than among Christians, and that these statistics do not represent the exact conditions. S. A. K. Strahan, Suicide and Insanity, London, 1893.